WE also have another condo listing: same size, condo 305-- listing number 1611316- sleeps four but possibly can accommodate 6 with an air mattress. ** RARE Find **** Reserved parking is right outside of building skyway entryway. There will be no need to find parking space during summer season. Your family can also skip the elevators as needed to avoid crowd and wait time. *** This condo unit daily rate- includes coffee, creamer, sugar, shampoo, conditioner and body soap, starter one laundry pod - Don't bring all those heavy amenities -- bring swimsuit and towels and enjoy the beach. NO worries, Walmart is walking distance if you forget to bring beach essentials. **5% WEEKLY booking special **** Best deal ! We r on beach 39 exit. The Majestic Beach Resort is a beautiful place right on the powdery white sand beach of the Gulf of Mexico. Imagine poolside gatherings, enjoying picnics, soaking up the sun, swimming in the clear ocean water, and watching breathtaking sunsets from the comforts of your private balcony. Come stay at this beachfront luxury resort condo with a balcony that steps out into the emerald green ocean view all day, every day. * Fully equipped kitchen for all cooking styles and needs including oven, dish washer, refrigerator, blender, toaster, can/bottle opener, microwave, and coffee maker: Coffee/ cream and sugar. * In-house market that serves Starbucks coffee, fresh breakfast pastries, gourmet sandwiches, and many refreshment. My husband and I are both adventurous travelers. It has been harder to travel since we expanded our family from two to four. Instead of going places, we transitioned to wanting more comfort of a home with a nature setting, and it is exactly what this amazing beach condo provides. We want to share our little home to beach lovers. Love nature and love life. I hope you enjoy your vacation and our home. 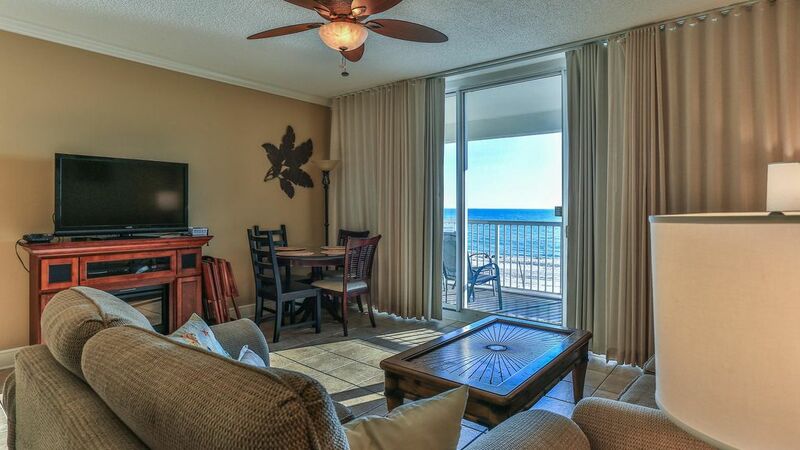 Our well-dressed condo is in the perfection location. It is on the 2nd floor which is easily accessible yet tuck in the complex. While sitting on the balcony, you will have the magnificent view of the gulf and inhale in the sound of the waves. Yet the long stretch of the gulf will not hypnotize you into sleep because the excitement of the nearby beach goers will keep you interested by their actions. Situated on the 2nd floors allow parents to relax on the balcony yet watch over the older kids playing on the beach. The amenities of the Majestic Beach Tower, 5 pools, movie theatre, movie rentals, market downstairs for quick grabs, and the employees are very sweet to deal with. A RESERVED PARKING SPACE TO SAVE THE HASSLE OF FINDING A SPACE IN THE BUSY SEASON. Parking Entrance is located at the 3rd Floor. Clean condo and awesome view! Sally’s place was impressively clean and organized. The linens smelled fresh and the sheets squeaky clean. The view was spectacular. We spent the whole night relaxing on the balcony. I will definitely comeback and stay here again. The host is very accommodating. We r right at the beach. It is also nice that we are on the second floor. All the stores r in close proximity. We had a great relaxing vacation. It felt like home. Property was perfect for the two of us. Very clean. Anything that we may have needed was already there. Owner support and communication was great. We stayed in this condo last year, and again this year. it’s completely different and so much more beautiful! Sally and John both were very attentive to any questions and concerns we had. it was very enjoyable. we will be spending our 3rd trip here again next year, absolutely love it!! Very Charming and Homey feeling. My family and I had a nice stay. The second floor room made it very easy with a small child. The beds slept wonderfully as well. The owners are very responsive and quick to answer any questions.